Located in the Bwindi Impenetrable Forest, Silverback Lodge offers a wide range of outdoor activities and accommodates guests in en-suite rooms with private verandas. 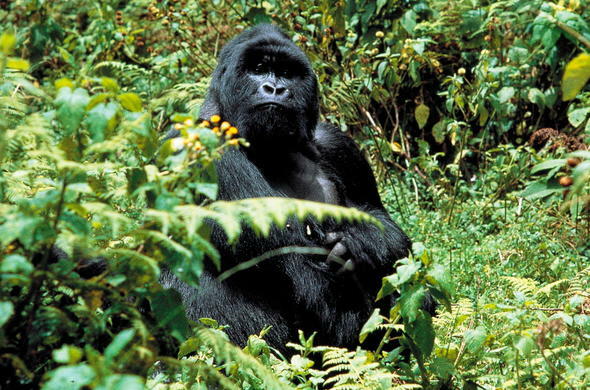 Track the famous mountain gorillas in the Bwindi Impenetrable Forest in Uganda. The 340 recorded gorillas make this region home to the world's largest population of the critically endangered primate species. Various hiking trails allow you to explore the forests safely and to admire the natural wonders of the Buhoma Sector of this UNESCO site. This Gorilla safari lodge in Uganda can be reached by road and by air, with private charter flights arriving at and departing from a nearby airstrip. Meet the local people on a guided village walk or partake in the more adventurous mountain biking excursion that takes you through the forest, to the nearby village. Accommodation at this lodge in southwestern Uganda is in 12 rooms arranged to sleep a single traveller, couples or friends travelling together. Built using local materials and resources, this lodge in the Bwindi Impenetrable Forest National Park has close connections with the local communities.